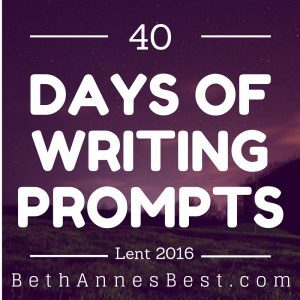 Welcome back to the #40LentPrompts link-up. This week was the first long week of Lent and we have 6 prompts to choose from.Go here to Monday’s post to view this weeks writing prompts. Make sure to use the hashtag #40LentPrompts when you share your posts on social media. I created these prompts but man this week has some hard prompts! I need to find some easy ones to fill in the blanks I have next week. There are a lot of songs that remind me of Lent and Easter and especially Holy Week. When I was in college I participated in a retreat program where we re-enacted Good Friday and there are several songs we’ve used in that skit that remind me of Good Friday. I know music is very powerful but I never really realize it until I hear a song I haven’t heard in 10 years and I can remember everything about what was going on in my life when I heard that song. Or where I was when I heard that song. This is really true with retreat songs. I’ll hear a song from a retreat and remember about the things that happenned at that retreat, the weather, the people. It’s really fascinating how much music can affect your life. I got an Operation Rice Bowl Box from church that I’ll be filling up with any change and other funds I have. My Operation Christmas Child boxes didn’t cost as much as I thought they would this year so I am going to send some of the money for that to this fund. I think I am going to make my Cheddar Broccolli Soup this week. We also have talked about going to this place that supposedly has the best fish sandwhich ever.